This magnificent Rolling Hills home in Tequesta, Florida is a gem! This four bedroom three bathroom floor plan is laid out over almost two thousand seven hundred square feet of perfectly appointed living space. 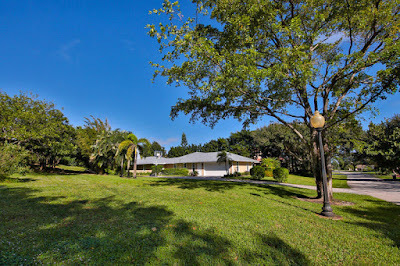 This is an rare chance to own in this gated intracoastal neighborhood of only fifty homes. This is a custom home on almost a third of an acre. The sparkling swimming pool is heated and is right off the lanai. The master suite boasts a steam room with french doors that access he pool and patio. This home has soaring ceilings. The office adjoins with the den. The second master suite with the roman shower is a plus. This is a open and airy floor plan. The roof, air conditioner, and pool heater were all recently replaced. The gourmet kitchen has new suite of stainless steel appliances, granite counter tops, an island, and cabinetry with soft close drawers. This home showcases a five hole chipping and putting green. The residents of Rolling Hills can launch kayaks and paddle boards from the community beach and dock or relax under the gazebo. you can enjoy Jonathan Dickinson State Park right across the street. Fine dining and shopping can be done at nearby Harbourside Shops.